Soft translucent silicon tubing to connect to Heliocentris Dr. FuelCell education products. ..
Soft translucent silicon tubing to connect to H-TEC Education products. This tubing comes i..
Soft translucent silicon tubing to connect to Horizon Fuel Cell Technologies education products. 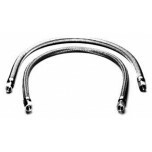 ..
Soft translucent silicon tubing to connect to hydrogen supplies or fuel cells with 1/8" barbed tu..
Semi-soft translucent silicon tubing to connect to pressure regulators, hydrogen supplies, or fue..
1/4 inch Inner Diameter (ID) stainless steel double braided hose with one 1/4 inch female NPT and..